Stephen W. Terrell's (MUSIC) Web Log: TERRELL'S TUNE-UP: Orion Unmasked! The life of Jimmy Ellis of Orrville, Alabama, is one of the greatest oddball rock ’n’ roll stories of all time. You probably aren’t familiar with the name of Jimmy Ellis. How about his stage name — Orion? Not familiar with that either? Well, no matter. 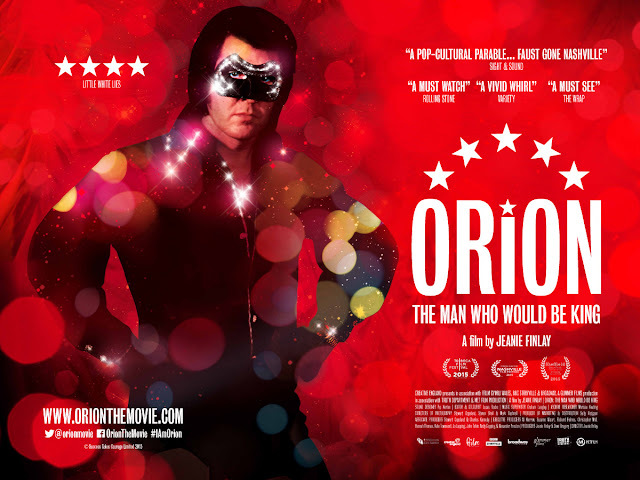 If you like true-life bizarre tales from the sleazy side of rock, you’ll enjoy the documentary Orion: The Man Who Would Be King. Ellis was born in 1945. He had an amazing gift — a singing voice nearly indistinguishable from that of Elvis Presley. But, as the movie by Jeanie Finlay explains, when Ellis moved to Los Angeles in the early ’70s to pursue a musical career, what he first saw as a blessing turned out to be a curse. No label of any size wanted to sign him precisely because he sounded so much like Elvis. At one point, after Presley died, Ellis released a single called “I’m Not Trying to Be Like Elvis” — but nobody was convinced. It was after this that things started getting strange. A novelist named Gail Brewer-Giorgio had written a book about a Presleyesque singer called Orion who had faked his own death to escape the pressures of fame. She was looking for someone to sing Orion’s parts for a never-made movie version of her book. She met Ellis through a mutual friend. Shelby Singleton got wind of the project and of the amazing singer Ellis. Singleton, a wheeling-dealing huckster on par with Col. Tom Parker himself, had purchased Sun Records — the company that launched Elvis’ career — from Sam Phillips. or one that tastes good? Singleton first had Ellis record a vocal track over an old Jerry Lee Lewis song, “Save the Last Dance for Me,” and released it as a single by "Jerry Lee Lewis & Friends." Similar duets came out on classic old Sun Records tracks by Carl Perkins and Charlie Rich — tracks that the real Elvis had nothing to do with. The way I see it, Singleton should have been arrested for desecrating historic monuments. Then Brewer-Giorgio’s Orion came to life. Under Singleton’s direction, Ellis donned gaudy jumpsuits and colorful Lone Ranger-style masks and went on the road. His first album had a cartoon of Orion ascending from a casket, but that tasteful idea went out the window after retailers objected. The album cover lifted text from the Orion novel (the documentary reveals that Brewer-Giorgio never got paid for it). 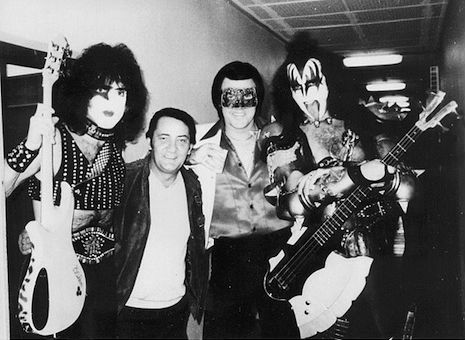 Many gullible Elvis fans actually believed that Orion was the King in disguise. And the Singleton-era incarnation of Sun Records, of course, did nothing to discourage the strange belief. At first Ellis basked in the dedication of his fans, which, according to the film, included a number of attractive females eager to offer themselves to the masked man. But as the record and concert ticket sales declined, he grew tired of the masquerade. In 1983, he tore off his mask, which proved to be a deal-breaker for Singleton. Sun Records dumped him, and Ellis’ career took a nose-dive. After trying a number of different names and personas, Ellis eventually went back to the mask. But the latter-day Orion failed to capture the old fire. Finlay tells the story through interviews with Ellis’ friends, family (including Ellis’ son), side musicians, and others. Brewer-Giorgio gets a lot of time. She spent much of her career writing nonfiction books, pushing the idea that Presley, like her fictional Orion, faked his own death. If Finlay mentions this in the film, I must have missed it when I blinked. Best of all, there is generous live footage of Ellis/Orion performances. And there is a still photo of Orion with members of KISS. Apparently they performed on the same bill in Europe in the early ’80s. Orion was a man haunted by hucksters. And unfortunately, Finlay engages in a little hucksterism of her own. Near the end of the film, she implies there might be a genetic reason Ellis sounded so much like Presley. Ellis was adopted, you see, and the only name for his father on his birth certificate was “Vernon,” just like … just like ... But mostly, Finlay brings real dignity to the life of a man who previously has been dismissed as merely a weird musical joke. Orion: The Man Who Would Be King opens at the Jean Cocteau Cinema (418 Montezuma Ave., 505-466-5528) on Friday, Jan. 22. 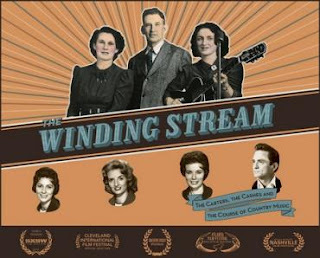 There’s another cool music documentary opening in Santa Fe this week — The Winding Stream, directed by Beth Harrington. This one is the story of the Carter Family, that venerated clan from Virginia often credited as the originators of what has come to be known as country music. The bulk of the film focuses on the original group: A.P. Carter, his wife, Sara, and his sister-in-law Maybelle. No, the Carters didn’t invent country music, but they were the first hillbilly vocal group to achieve widespread popularity. And A.P.’s determination to collect and record the songs of the mountains helped ensure the endurance of this music. Making a case for the importance of the Carter Family is not a major undertaking. Just on the strength of their most famous songs — “Will the Circle Be Unbroken,” “Keep on the Sunny Side,” “Wildwood Flower,” and others — their reputation would be set in stone. Through interviews with various Carter descendants, Harrington brings warmth and depth to those stony icons, A.P. and Sara Carter. And that helps you appreciate the classic songs even more. And the doc is full of wonderful music including archival footage plus more contemporary versions of Carter songs by the likes of George Jones, John Prine, Roseanne Cash, The Carolina Chocolate Drops, Grey DeLisle & Murray Hammond and others. One quibble: There is little footage of the original Carters performing. Harrington tried to bring some of the songs to life by animating still photos. Unfortunately this process looks like some modern-day Clutch Cargo cartoon, more bizarre than illuminating. The Winding Stream opens at The Screen (Santa Fe University of Art & Design, 1600 St. Michael’s Drive, 505-473-6494) on Friday, Jan. 22.